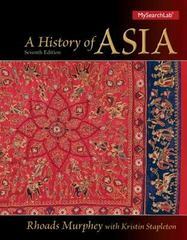 A History of Asia 7 Edition Charts the deep, diverse history of the largest continent A History of Asia is the only text to cover the area known as "monsoon Asia"--India, China, Korea, Japan, and Southeast Asia--from the earliest times to the present. Written by leading scholar Rhoads Murphey, the book uses an engaging, lively tone to chronicle the complex political, social, intellectual, and economic histories of this area. Popular because of its scope and coverage, as well as its illustrations, maps, and many boxed primary sources, the new edition of A History of Asia continues as a leader in its field.